Excellent questions, this is a good dialog. I believe this is an effective way to bring you up to speed on the situation in a rapid manner. Perhaps you should visit the site. It has helped others tremendously to understand the issues. Absent such a journey on your part, I have attached some pictures I took last winter. Pictures IMG_1942 and IMG_1944 are looking from the top of the dam, at the position marked A on the map below, looking towards the yellow area which is the approximately 35 foot deep hole. As you can see in the map, the Giovionato Land is marked, and is bordered on the North by Brush Road, and on the south by the straight line. This is a topographical map, so you can see the stream bed where the water flows. The culvert failure site is shown in yellow, and then the dam with the road passing over it, and then heading to the edge of Sal's land. The picture IMG_1945 is also taken from the spot marked A, but looking more to the left, towards highway 17, and you can see a car coming up the road. In this picture you can see on the right the vertical part of drainage structure, and the relative size of the car, and you get the sense that you could pack four or five cars into this hole; and that there is no fence or barrier to slow down such cars. In 2006 a grandmother visiting her kids home up here failed to make the turn and drove into the edge of the hole, but stopped in time. Back on picture 1942 you can see the edge of the dirt where it has caved in, and the brown markings on the vertical pipe. Originally, the dirt covered the vertical structure up to the brown markings. 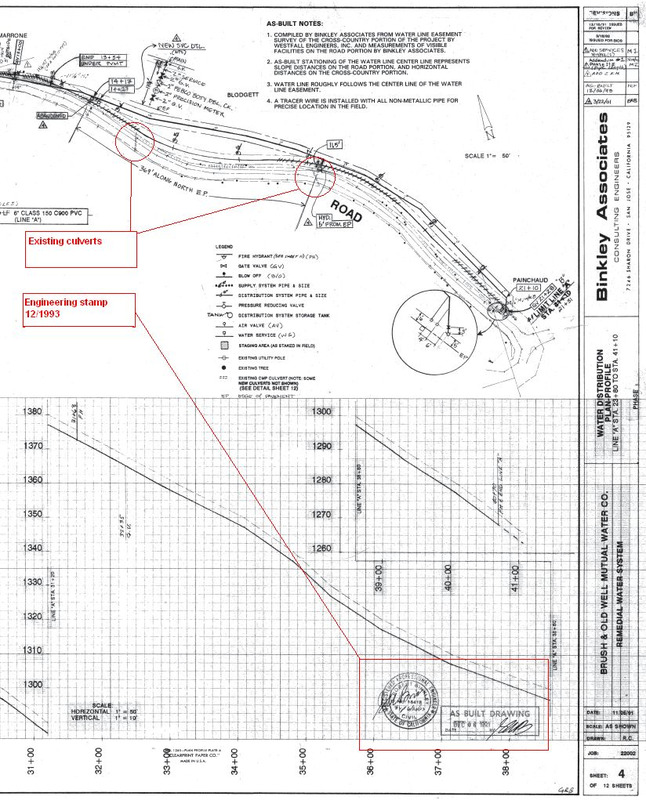 So this section marked in yellow is the "water trapped behind the dam", which is eroding the bank, and threatens to eat under the road from the up stream, yellow side, not the downstream side; that section (marked 'c') is fine. Picture IMG_1946 is taken after we walk down the road in the direction that yellow car came from, and we get to the edge of your clients property (marked B on the map). Picture 1947 is taken from point B, but looking to the left of the road, to the point where the water comes out of the pipe; this point is marked c. Picture IMG_1951 is the view the person in the yellow car would have if she got out of her car and looked towards the culvert. So, I hope this virtual tour has helped you understand more the site, the depth of the hole, and the magnitude of the problem. I answer your other questions inline. We get into a cost situation here. Your client has not contributed any money to the culvert discovery project. [Editor: Sal's check arrived later that day] The Brush Road Company maintains the road which begins after the area where the problem exists; not this section. Members of the Brush Road Company do have an easement for ingress and egress over this section of Road. The 27 other members of the Corporation have advanced funds in 2005 to give us the ability to engage surveyors, lawyers, hydrologists and engineers to study the problem and come up with solutions. Your client has not contributed to this fund; despite the fact that he has a deed obligation to do so. The Brush Road Corporation has no authority to permit our agent to go beyond our twenty foot easement on to your client's property and ascertain where on his property this structure exists. That said, there are existing field marks at the corners of the State's property, which someone from the State has highlighted by attaching plastic tape into the trees above their position. This is not a certified survey, and we have asked, and the State has agreed as a part of the settlement to install clear, permanent property boundary markers at the edges of their property. We would encourage you to hire a certified surveyor and have him find the property corners and mark them (perhaps installing a 4x4 redwood post, so that they are easily discernable, in order to make all of the boundaries of your clients property very clear; and further to determine where on your clients land the drainage structure resides. I also would like verification that the drainage structure was installed at the same time as the road improvements for this section of Brush Road. And we would like this also. Ideal would be to find the contract between the builder and the owner, and the cancelled check showing who paid for it. As I stated previously, the road was built from 1938 until 1940. The best verification we have is the Highway 17 As Builts we obtained from the California Department of Transportation, where page 4 shows the right of way they obtained, and shows the old alignment of the Ridge Road and Ranari Road, and then page 6 (the As Built) shows that Ranari Road access is gone, the new Brush Road access road is built, and the culvert is detailed. So we have the before (1938) with no road or drainage structure, and the after (1941) with both in place. Has the State acknowledged that all of these drainage improvements were constructed as part of their Highway 17 improvements or has that been assumed from the circumstances? The State could find no evidence that they built it, or that they did not build it. They are taking the position that since it is not on their land, that they did not build it. We took the position that the later acquisition of the Logan land (in 1941) shows that perhaps they in the spirit of "Get it Done" built the highway and necessary roads and drainage structures where it made sense to do so on the field, and then later did the paperwork back in the office to clean up any property issues later, and that perhaps this one fell through the cracks. Then they advanced the thought that perhaps Logan was willing to sell them his land, but Foster was not, and perhaps Foster agreed to maintain the structure even though possibly the State's contractor built the structure. Or perhaps Foster built the structure, and had no desire to give the state any of his land. Then early this spring they dug into your client's title, and discovered the existence of the Foster-Steinbeck agreement, where the entire length of the road, including the length crossing the dam and drainage structure is called out, and it is stated that Steinbeck paid for the construction, repair, maintenance of the road, that he retained rights to continue to use and repair the road, and that Foster has no responsibility to pay for any of these repairs as long as he lives (therefore implicitly, after his death (or he sells the land), this guarantee from Steinbeck expires). This Agreement establishes the right of the Brush Road Corporation to cross Sal's land and use the road, as well as to maintain the road (it is an ingress & egress easement). No mention is made of the drainage structure. We could compel the State via discovery to share with us all of their records, and go on a witch hunt through their files. The Brush Road corporation is not in a position to do this, because we do not have standing to file a lawsuit (The structure is not on land that is owned by the company. Perhaps when and if the structure's failure destroys the road, we would have standing, but it is not clear that the defendant would be the State of California at that point; and in such a scenario we would be flying helicopters to get to our land). You need to advise your client, but I am not entirely sure if your client has standing either; as it is presumed by the courts that when one purchases property one accepts it in the condition as it is disclosed to you. Sal might have a disclosure issue with the person who sold him the land. Perhaps the person who purchased the property from Foster had some standing to file a suit against the State of California, but it is my understanding that the successive owners get it the way it is when it is conveyed to them (I believe this is called estoppel by deed). What maintenance has been done to the drainage structure since its installation? Has the State acknowledged any maintenance to these structures during their "friendly neighbor" duration? The State fully acknowledges that they have been continuously maintaining the structure from 1938 until 2005. Long time residents of Brush Road confirm this, reporting that CalTrans workers would regularly inspect the drainage, and once every few years excavate around the structure to avoid too much build up of silt and other debris. Please again recognize that CalTrans has an imperative to keep the State Highways open, and they do an excellent job of doing the maintenance necessary to make this happen. We presume that in doing such a cleanup, it is likely that they damaged or weakened the structure (perhaps they hit it with a backhoe or front end loader), and that subsequent storm water runoff found the weakened point, and has precipitated the ongoing failure of the structure. Or alternatively, the structure is 70 years old and was only rated to last for 50 years, so it is outside of its service life. We believe that their fear that our argument would carry weight with a jury led them to offer the $42,000 to fix the problem. Again, we would need your client to advance the suit, as he is the only currently injured party (Sal owns the structure that would be alleged the State damaged); Brush Road Corporation would gain standing by suffering damage when and if the failure precipitated a partial or complete collapse of Brush Road. I note that the Ridge Road owners have been singled out for direct participation. I presume that they are not members of the Brush Road Corporation. It would seem that they would need to become members if the road segment in question becomes the obligation of the Corporation since without a right to use this section they will be landlocked. One way for them to gain clear title would be as you describe, for them to join the Brush Road Corporation, and hence get access to its easements.. Alternatively, your client could grant to each of them an ingress-egress easement over just this road segment. As is clear from the Foster-Steinbeck Agreement, such access has not been granted in the past as the Agreement required this to be recorded, and approved by Steinbeck or his grantees. I have seen no evidence that restriction has been eliminated. With the formation of the Brush Road Corporation in 1988, all of the easements each member held were granted to the corporation for the use of all the other members. 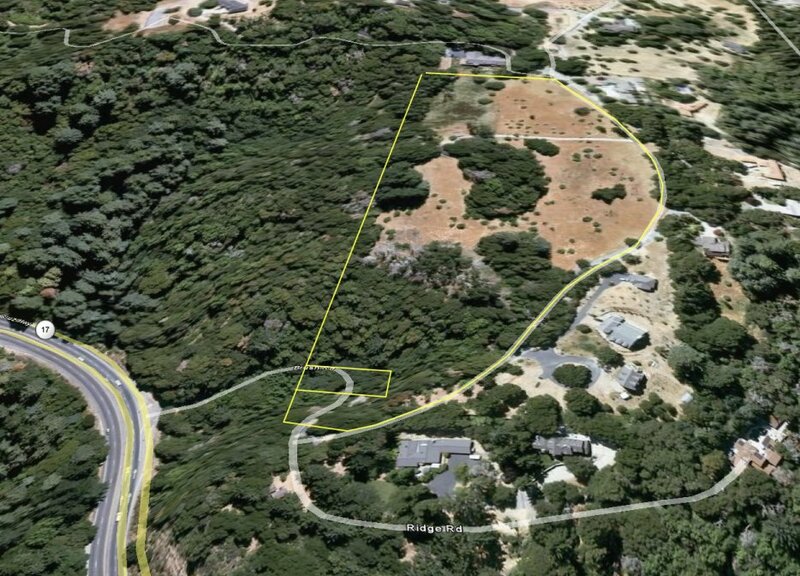 One of these easements is the Foster-Steinbeck Agreement, and as such, you client's granting of access over this portion of the road to the Ridge Road parcels well may require the approval of the Brush Road Corporation. In any case, it is my sense that the feeling of the BRC is that it would be best from our perspective that your client grant to the Ridge Road folks access just to the road segment that they need to get access to their homes. If indeed we still have this right of approval, we would need a vote of the members, which I would be happy to conduct. In any case, once they have access, we would either require them to contribute to a BRC fund that is designated specifically for the maintenance of the structure and the short road segment; or we would form a second corporation (perhaps a subsidiary of BRC) to administer this road segment, and have them join that entity. I believe that, in the interim, my client will need an acknowledgement from the Corporation and the Ridge Road owners that any use of the segment of Brush Road previously believed to have been on State property, but now believed to be on my client's property, is with the permission of my client, and not pursuant to any prescriptive rights. The Brush Road Corporation parcel owners have clear deed rights by easement granted under the Foster-Steinbeck agreement for egress and ingress over this road, including the segment that many assumed was on State land. This is a clear title, and it is shown as Parcel 2 on your client's title report. The Ridge Road people are in a murkier state. We have suggested that your client grant specific easements to each of these parcels to clear up any perception of prescriptive easement. This mostly is a matter between your client and these owners; BRC (may) have a right to deny such a grant, again based on the Foster Agreement; and we would certainly approve your client granting to these parcels the right to cross the minimal segment needed to access the State Highway from their parcels. That is also my read of the California code covering prescriptive easements. I believe further that in California the party wishing to establish prescriptive ownership rights must also demonstrate that they have paid the property tax. However, despite the fact, or possibility that some or all of the Brush Road members incorrectly assumed that their rights to cross this road segment were based on their common ownership as residents of the State of California, it is the case that they have a clear, restricted right to use the segment based since 1988 on their membership in the Brush Road Corporation, and before that as grantees of various properties carved out from the Steinbeck ranch, and the easement granted to that land by the Foster-Steinbeck agreement. We had a half dozen engineering contractors examine the site, and propose possible fixes. The CalTrans Engineers examined the site, and proposed inserting a 20 inch diameter plastic pipe into the existing 25 inch corrugated steel pipe as a fix. We then engaged (at Brush Road Corporation's expense) an engineering design firm to design the best solution based on these inputs, and what was designed is close to what you describe. They inspected the site and determined that there is significant erosion of the pipe walls under the road (the horizontal segment is about 100 feet long), such that it would not be possible to insert a 20 inch diameter pipe for the whole length; and that a smaller diameter would not be sufficient to carry the entire flow of water given a storm that happens once a century. 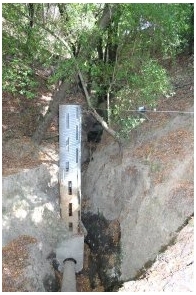 They recommended that the cheapest, best solution is to insert a 4 inch pipe into the existing 25 inch CSP, and build essentially a french drain at the base of the canyon (perforated pipe that would let water flow in, but not be blocked by a few leaves or rocks), and then cover this with rock and an binder to hold it all together, but still allow water to seep down to the french drain. Then we would cover this with dirt up to the grade level, and then build a channel on the surface (or lay a pipe juts below grade) which is set up to accept the storm runoff, and direct this through a large 4 foot diameter pipe that would be just a few feet beneath the road surface, and take this water out to a diversion road field which would slow down the water, and continue it on its way to the next drain, which takes the water underneath the State Highway. We have bids in the range of $100 to 120k for this. (which I attached in my first email to you). This is also a possibility, although based on the expert's opinions, it would cost a lot more to remove the existing dam, relocate the soil somewhere, and build the replacement bridge. If there is a catastrophic failure this winter (effectively removing the soil, hopefully not blocking State Highway 17), then we would most likely install an emergency bridge at great cost as a rush job. or retention facilities on the downhill side of the road segment where the most problematic erosion has occurred? Actually the failure is at the face of the dam, the uphill side of the road; this is eroding and collapsing into the hole, and then the dirt flows into the existing pipe and down the mountain. If we made the face of the dam stronger, but did not shore up the integrity of the pipe under the road, then if/when that pipe collapses and gets blocked with debris, this would lead to a build up of a lot of water behind the dam, which would make the situation worse, as that water is heavy, and the dam is not designed to be strong enough to hold back this weight of water, and it would collapse; and of course before that it would flow over the top of the dam (where the road is) and make access to our homes impossible. Are we simply proceeding under the assumption that the current situation is the best solution to the problem? We have spent about $10,000 to get considered engineering opinions on the best solution; in addition we have gotten the free advice from the State Department of Transportation and from the various engineering contractors who have bid on the job. We could always get more opinions, but perhaps this is enough?